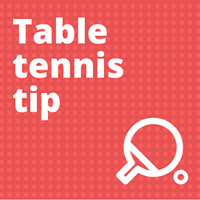 If you play table tennis at an amateur level, especially at lower levels, you can dominate your opponents with long serves. These are serves which land very deep on your opponent’s side of the table, ideally with a lot of speed and spin. In this blog post, I explain why long serves are effective (especially at lower amateur levels) and how to do devilish long serves which can give your opponents nightmares. When I started as a coach, I discouraged players from doing too many long serves in a match. I told them it was too risky because long serves are easier to attack. I told them to mainly serve short or half-long, where the second bounce on the opponent’s side is just past the end of the table. These shorter serves are much harder to attack. I picked this advice up from other top coaches, and I was merely repeating what that they had told me. I think this is actually very good advice, but only if you are playing at a higher level, against really good attacking players. But over the years, I have come to the conclusion this may not be the best advice for all players, especially lower level players. If you play at a lower level, I find the opposite is actually true. Lower level opponents tend to be more defensive and passive (lots of pushing, prods, swipes and chops). They are less bothered by short and half-long serves, because they are not looking to attack. They mainly want to play safe, which is easier to do when returning shorter serves. But long serves can give lower level players nightmares. These players have less confidence and consistency when attacking, so they rarely attack long serves. Instead they still push, prod, swipe and chop. But because the serve is long, fast and spinny it is far harder for them to control the ball, playing these sort of strokes. Or if they do attack, the stroke is often a bit wild and erratic. The result? The ball flies off the rubber high, wide, long or in the net, giving the server either a cheap point or an easy ball to attack. So now when I coach lower level players, I tell them that it is absolutely fine to do lots of long serves. Serving long is usually the best tactical thing to do against other lower level players. Good quality long serves can also be very effective at high amateur levels too (and even at the professional level against some opponents). My team-mate Yordan has got a great range of long serves. I have been playing with him for many years and have seen first hand how effective they can be. Lower level players don’t really stand a chance against his serves, but I have also seen his serves baffle, demoralise and defeat players of a much higher ranking. The same is true for me. In some matches I start serving short or half-long, but don’t seem to be gaining too much of an advantage. But when I start serving long, fast and spinny, it can be a game changer. If I sense my opponent is really uncomfortable returning the long serves, I serve long much more often and the match dynamics begin to change. What is a good long serve? So long serves can be very effective at lower levels and very effective against some opponents at higher levels. But, and this is a big ‘but’, a long serve only works if it’s a good long serve. If your long serves are too slow or too bouncy or a bit too short, then they can be easy to attack by a player of any standard. In terms of spin, a good long serve could be topspin, side-top, side-back, backspin, or no spin. If you can develop a range of long serves with different spins, like my team-mate Yordan does, you can cause havoc. The key to executing a fast long serve is to get the first bounce (on your side), to be very close to your end of the table. This means the ball will have enough space to clear the net and come back down on the other side. If your first bounce is too close to the net, it will usually end up in the net. And the second bounce should be close to your opponent’s end of the table. I strongly believe every player should develop at least one very good, spinny, fast long serve. Of course, it’s very important to practise short and half-long serves too, but don’t neglect long serves. At lower levels, you can win a lot of cheap points with long serves. And at higher levels, using a few more long serves can be a great way to keep your opponent guessing and unsettled. I really don’t like returning long, fast, spinny serves either! Ironically, as my standard has improved and I play stronger players, I am far more likely to face mostly short or half long serves. I am quite comfortable with these most of the time. But give me a long, fast, spinny serve and I get a bit panicky. If my opponents served longer more often, they’d destroy me too! This post was originally published on 28 May 2015 and updated on 18 May 2018. I am also training on a few fast long serves, not there yet, currently 50/50% error margin but when they do as planned, they’re often very confusing for my opponent. I find it very difficult also to disquise my intentions….overal when serving but it gets better.